This was the first bread I made on my own and it is still my favorite. I love the taste of freshly made bread right out of the oven, but the best part of this recipe, it is so easy you can make it during the week. I promise. I just made it last night! Baking to me is like therapy. I can have a horrible day at work and feel like I just can't manage anything going on in my life, but the second I get in the kitchen and start baking it's already a better day. I am sure you know what I am talking about. Yesterday I was a little nervous since I haven't had bread luck lately, so I went back to basics. This bread is the basics. Using small amount of shortening, grease all sides of a large bowl and a 9 x 5 x 3 loaf pan, set aside. Sift together 1 and 1/2 cups of flour, the sugar, salt, and yeast. Add in warm water and oil and beat on low speed for one minute, scraping sides and bottom of bowl as needed. Beat on medium speed for an additional minute, scraping sides as needed. Add in egg and beat till blended and smooth. Add in an additional cup of sifted flour and blend till dough begins to pull away from sides. To knead with stand mixer: Mix in an additional 1/2 cup flour, then replace paddle with dough hook and set on low-medium speed for 10 minutes or until dough is smooth and springy. Be sure to scrape down dough as it climbs the hook. To knead by hand (my preferred method): Place dough on lightly floured surface and have 1/2 cup flour on standby to use as needed. Knead dough for 10 minutes or until smooth and springy. Place dough in the greased bowl and turn until all sides of dough are greased. Cover with plastic wrap and a towel. Let rise in a warm place until doubled ~1 to 1 and 1/2 hours. When dough is ready push fist into center to deflate (that is my favorite part). Place dough on smooth surface and roll out to a 9 x 18 inch rectangle. Beginning at one 9 inch side roll dough tightly and pinch the edge to seal. Using your hands press each side of dough roll to seal. Place the folded ends under the loaf (seams side down) in the greased pan. Loosely place greased plastic wrap over pan and let rise in warm place until double ~1 to 1 and 1/2 hours. Preheat oven to 375 degrees and move oven rack to low position so top of loaf is equal with center of oven. Bake for 30 to 35 minutes or until bread is golden brown. Remove from pan immediately and coat with melted butter, let cool. These are just my tricks, I am no professional so if you've got other advice let me know! That's a lovely looking loaf. I love making my own bread too! that's a beautiful loaf of bread - great job! Baking is VERY theraputic, I agree! (So is eating the baked goods!) Gorgeous bread! I love freshly baked bread!! This looks very easy and straightforward! I've only made bread with yeast a few times. This sounds perfect for someone like me. Saved it - will definitely be trying this recipe ASAP. I know my BF will appreciate freshly baked bread too! This bread looks so fluffy and fresh! OH I wish I had some of this. fluffy and amazing bread! gotta try out your recipe for sure! Great looking bread! Sometimes simpler recipes are the best, most versatile ones! This bread looks yummy! I recently bought some pumpkin butter when I went to the cider mill out near me, and have been wanting to make some fresh bread to eat it with. This looks divine! 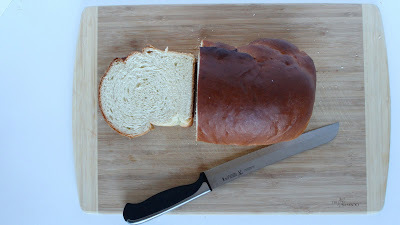 I love egg bread and will have to bake some now that the cooler weather has arrived. Thanks for the inspiration! I love bread and this recipe sounds delicious! And beautiful too. I love to bake, its just fun for me....your bread sounds like a great easy recipe! potato bread is my favorite! It looks beautiful and delicious.I hope you could add this foodista widget to this post so we could get this update on your recent recipe.Thanks! Congratulations on a beautiful loaf. I am partial to egg breads. This is similar to the (only!) bread I make that I learned from my mom. I adore it! You're right about it's therapy powers and I can gobble an entire loaf. Love that last butter tip, too, I'm going to try that next time! Your bread looks perfect! I have a similar basic bread recipe that I also use as my standard go to. There is nothing like the taste of fresh baked bread out of your home oven. It does have a great soothing effect. What a beautiful loaf of bread. I agree, there is nothing like homemade bread right out of the oven. I love how you describe baking being therapy to you. I can totally relate, with cooking and baking. Yesterday was a tough day, and so I made some pie crusts and it was all better. This bread looks marvelous, and the color is perfect. Thanks for sharing, Debbie! I always look forward to seeing what you're baking next! I think you did an awesome job. Bread is still work for me. Makes me nervous. I can't wait til I get to the point that it's therapy! i really want to foray into bread baking and have been collecting recipes around. i like this one of yours. a doubt-you say 3 to 3 and 1/4 cups flour but the method uses only 1 and 1/2 cups and another 1/2 cup. is it so or didn't i read well enough? @kitchenmorph: Yes there is an additional cup, it needs to go in directly after you add the egg and before kneading. Let me know how it turns out!